Logistics News: Where Does the Intelligence Belong in Automated Material Handling Systems? Logistics New: Where Does the Intelligence Belong in Automated Material Handling Systems? Logistics New: Where Does the Intelligence Belong in Automated Material Handling Systems? The "battle" between Warehouse Management Systems (WMS) and Warehouse Control Systems (WCS) continues to heat up, with many WCS providers significantly enhancing their functionality to the point where they sometimes encroach on to traditional WMS territory in such areas as order picking management. Companies themselves frequently don't get well engaged with these decisions because the automation interface is often viewed as a "black box" that is really sort of out of their control. As WCS technology clearly advances, sometimes it leads to questions about where the intelligence (i.e., the decision-making) in an automated material handling system in a distribution center should lie: in the WMS or the WCS? "I often say that with a WMS it is really more about flow than it is about speed, and that is especially true with an automated system," Fralick observes. "When I go in and see an automated system that does not even look like it is huffing and puffing to get its volume out, then I know it is a well-oiled machine that has been well integrated." How do you get there? It involves a number of key decisions, Fralick says. He likes to think of an "event-action" model, where the WMS is in charge of all the real decisions about what products go where, and the WCS simply executes those decisions. But sometimes, that kind of decision intelligence winds up being split and going into both the systems, and that can lead to real problems. "If you [the company implementing an automated system] don't get involved in the decision, you can wind up with a hodge-podge approach," Fralick says, adding that this can have a real impact on flexibility down the road. When changes are needed in how the system works to meet new customer or other requirements, then it "becomes a big issue with multiple vendors involved," Fralick says. "You may have to make significant changes in not just one system but two, and coordinate those changes. It is going to be a lot more expensive, take longer, and increase the risk." How does this happen? Often, the automation user doesn't get fully involved or even understand the decisions that are being made by the WMS vendor, the materials handling/WCS vendor, and perhaps a consultant. "The driver of those decisions is often what's easiest for everybody, " Fralick says. The problem is that what seems easiest at the time is often is not what's best for the system over the long run." 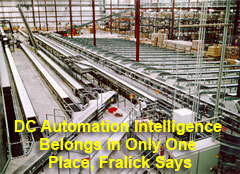 Typically, understanding the need for flexibility and control will drive the decision to put all the system intelligence into the WMS side, Fralick contends. "The WMS should have all the information it needs to make all the decisions," Fralick says. "The WCS should just take that decision about where a carton goes, deliver it, and then tell us that it's there. With this approach, you avoid a lot of potential issues about where the logic for something really lies." Companies themselves frequently don't get well engaged with these decisions because the automation interface is often viewed as a "black box" that is really sort of out of their control. But he believes the WMS project manager at a company needs to be fully engaged in these discussions and decisions. Fralick adds that he has seen scenarios where when some of the intelligence has been put into the WCS that to test needed changes, the automation system has to be taken down, all the boxes cleared from the conveyors, etc. When all the intelligence is in the WMS, on the other hand, usually the changes can simply be piloted after making changes in the WMS by just dedicated a lane or two to the testing - a much easier process. "That way, the WCS's job doesn't change, it just executes what we tell it," Fralick says. "It also eliminates a huge risk in modifying just one system instead of two." What's your reaction to Fralick's views on WMS and WCS? Is there a case for having system intelligence in both places? Let us know your thoughts at the Feedback button below.